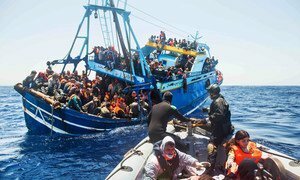 Denouncing the dangers faced by migrants and asylum seekers in Libya, the UN refugee agency (UNHCR) called on Friday [23 November 2018] for an end to their detention and advised those intercepting or rescuing them at sea against returning them to a country where they face “squalid conditions”. © UNHCR/Noor Elshin | Refugees waiting at Tripoli International Airport, Libya, for their evacuation flight to Niger on 16 October 2018. As large numbers of refugees and migrants continue to attempt the dangerous crossing of the Mediterranean from Libya to Europe, according to the International Organization for Migration (IOM), many are being intercepted by the Libyan Coast Guard, brought back to shore, and placed in detention upon arrival. These interceptions or “rescue operations”, have led to the placement of large numbers migrants in official detention centres, nearly doubling between 2017 and 2018, from 5,500 to 9,300. “It is reprehensible that they are detained instead of protected. This is despite the fact that viable alternatives to detention within Libya can be found, including through a Gathering and Departure Facility that we have been waiting to open since July, which could offer immediate protection and safety for those most vulnerable,” said Mignone. When opened, the facility proposed by UNHCR would be the first of its kind in the country, sheltering vulnerable asylum seekers until a solution could be found to get them out of Libya. Though the facility has been built and is ready for use, the UN agency is facing delays from the Libyan authorities and continues to advocate for it to be opened. In the meantime, in light of the dangers for refugees and migrants in Libya, UNHCR does not consider it to be a safe place for disembarkation and has advised against returns to Libya following search and rescues at sea. In addition, IOM and UNHCR have been working to evacuate these migrants from Libya to other countries. In the past year, UNHCR has evacuated almost 2,500 vulnerable refugees and asylum seekers – including over 300 unaccompanied children – held in detention in Libya, to Niger, Italy and Romania, where they are hosted in UNHCR transit centres while longer-term solutions in third countries are being sought for them. In parallel, in 2018, IOM has safely returned over 11,000 of the most vulnerable to their countries of origin. However, the agency reported in August that its voluntary repatriation programme in Libya is unable to keep pace with the alarmingly high number of migrants in Government detention centers wishing to go home. Given the difficult circumstances facing refugees and asylum seekers trapped in Libya, the UN continues to advocate for alternatives to detention and for more support for evacuations, which remain a crucial lifeline for the most vulnerable. As many refugees remain in Libya and in need of urgent evacuation, UNHCR urges more countries to come forward with additional possibilities of places for their safe resettlement. (SOURCE: UN).